Another centerpiece for you, the Bow and Arrow. Central to every Zelda game, the bow and arrow is useful to Link to both attack enemies and solve dungeon puzzles. The design for this bow and arrow immitates the design from Legend of Zelda: Skyward Sword. 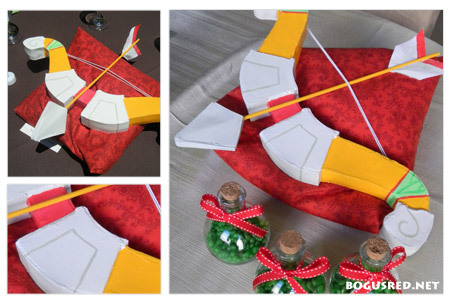 The bow is made from craft foam, a bit of marble paste, and a string of elastic. The arrow is made from a wooden dowel, paper, and craft foam. Both painted with liquitex acrylic paint. Did I mention that it really shoots?